​Portuguese court ruling puts bailout exit at risk 1.8 out of 5 based on 4 votes. 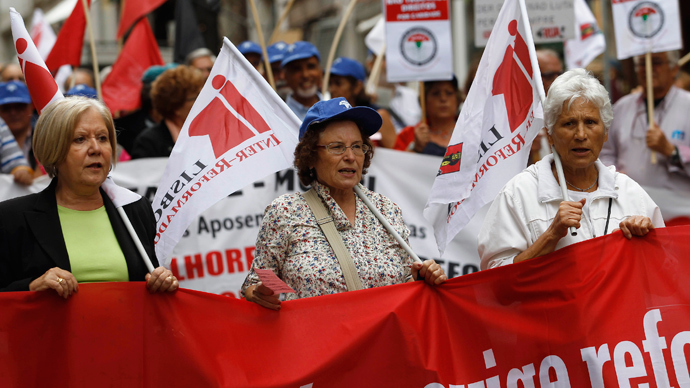 A court in Portugal has rejected a plan to save an estimated 388 million euro next year through pension cuts. It could become a major stumbling block in the country’s planned exit from the international bailout in June. 13 judges unanimously considered "unconstitutional as this violates the principle of trust", the 10 percent cut in state pensions for anyone getting more than 600 euro a month, which would save the government 388 million euro. The Portuguese parliament has already agreed to budget cuts of 4 billion euro, says Euronews. The court is seen by economists as the major obstacle to narrowing the budget deficit, proving to creditors the sustainability, and escaping the bailout, as it has rejected a series of austerity measures. After investors lost confidence in the country's ability to pay its debts, Portugal submitted to a €78 billion ($107 billion) bailout program with the European Union and International Monetary Fund in 2011, which will end next June. The government commented that it had not prepared any alternatives to recouping the money deemed unconstitutional by the court. Prime Minister Pedro Passos Coelho warned in advance that if the Constitutional Court decides the reduction of pensions illegal, the authorities will be compelled to increase taxes that will negatively affect the investment climate in the country. The Troika of lenders consisting of the IMF, European Central Bank, and European Commission has just visited Portugal, and also warned that refusal of cut spending could lead to unemployment growth. Ireland was the first country to work its way free of rescue loans by pulling out of the IMF/EU bailout program. The Troika checked on Ireland 12 times after it gave the country a bailout making sure it was keeping to the agreement.